In Central Asia, government leaders and government-aligned clergy use the term “Wahhabism” to denote “Islamic fundamentalism” and “extremism.” It is often used as a slur, with strong political implications.89 There is a common misconception, encouraged by the government of Uzbekistan, that within Islam there are three schools: Sunni, Shi’a, and Wahhabi. In fact, Wahhabism, a revivalist movement that grew out of the Hanbali school, is a branch of Sunni Islam practiced in Saudi Arabia and elsewhere. The name derives from its eighteenth century founder, the Hanbali teacher and reformer Muhammad ibn ‘Abd al-Wahhab (1703-1792). Wahhabism advocates a purification of Islam, rejects Islamic theology and philosophy developed after the death of the Prophet Muhammad, and calls for strict adherence to the letter of the Koran and hadith [the recorded sayings and practices of the Prophet]. In promoting what its adherents view as the precepts of early Islam, Wahhabism maintains a strict and puritanical view of religious rites. It eschews "innovations," including practices viewed as polytheistic, such as the worship of saints, mysticism, and decoration of graves. It prohibits dancing and music. Indeed the vast majority of those branded by the Uzbek government as “Wahhabis” had little in common with the relatively small group that actually follow Wahhabi doctrine. Notably, they were almost without exception adherents of the Hanafi school. Independent Muslims who were followers of the Hanafi school were not necessarily in favor of the establishment of an Islamic state, or application of shari’a in Uzbekistan. Consistent with Hanafi principles, many were believers, but were not all strictly observant practitioners. They often continued to observe pre-Islamic, namely Zoroastrian, rituals.97 Qualification as a “genuine” Muslim, then, has been for them more dependent on submission to God and his Prophet Muhammad than participation in rituals and strict adherence to duties.98 Religious rules regulating marriage, divorce, funerals, and other ceremonies differed dramatically from those followed by Wahhabis. 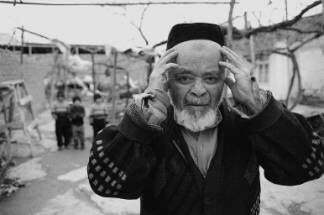 Many independent Muslims in Uzbekistan objected to the politicization of religion both by Wahhabis and by the government. Many so-called moderate Muslims were branded “extremists” and, ironically, “Wahhabis” for repudiating the government’s injection of politics into sermons and rituals. Under President Karimov, a person who moved beyond the official, limited definition of religious observance—by studying Arabic in order to read the Koran in its original language, sticking strictly to the observance of the five daily prayers, or appearing in public dressed in a way that suggested piety—was considered deviant or “Wahhabi.” People have also been called “Wahhabi” for showing respect for or declaring allegiance to any authority not sponsored by or directly associated with the state structure—this was viewed by the Karimov government as an affront to its power, a danger to be curbed. Thus, visits to the homes of local religious teachers, attendance at mosques not registered with the state, and most importantly the placement of loyalty to Islam before loyalty to political leaders, were regarded by the state apparatus as displays of excessive independence. Refusals by imams and others to serve as informants for the state security agents regarding the activities and beliefs of their coreligionists was similarly seen as unacceptable insolence. Hizb ut-Tahrir members form a distinct segment of the independent Muslim population by virtue of their affiliation with a separate and defined Islamic group with its own principles, structure, activities, and religious texts. Some in the diplomatic community, in particular the U.S. government, consider Hizb ut-Tahrir to be a political organization and therefore argue that imprisoned Hizb ut-Tahrir members are not victims of religious persecution.102 But religion and politics are inseparable in Hizb ut-Tahrir’s ideology and activities, and one of the chief reasons Uzbek authorities arrest members is the religious ideas Hizb ut-Tahrir promotes: the reestablishment of the Caliphate and strict observance of the Koran. Even if one accepts that there is a political component to Hizb ut-Tahrir’s ideology, methods, and goals, this does not vitiate the right of that group’s members to be protected from religion-based persecution. Members meet in small groups of about five people, referred to as “study groups” by members and as “secret cells” by Uzbek government officials. Both sides acknowledge that the primary activity of these small groups is the teaching and study of Hizb ut-Tahrir literature, as well as traditional Islamic texts such as the Koran and hadith. Membership in the group is solidified by taking an oath, the content of which has been given variously as: being faithful to Islam; being faithful to Hizb ut-Tahrir and its rules; and spreading the words of the Prophet and sharing one’s knowledge of Islam with others.104 Law enforcement and judicial authorities generally considered both those who had and had not taken the oath as full-fledged members. In Human Rights Watch interviews and in court testimony, Hizb ut-Tahrir members have overwhelmingly cited an interest in acquiring deeper knowledge of the tenets of Islam as their motivation for joining the group. Hizb ut-Tahrir members in Uzbekistan, and likely elsewhere, regard the reemergence of the Caliphate as a practical goal, to be achieved through proselytism. 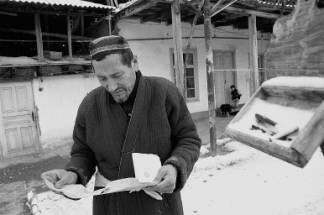 Members in Uzbekistan distribute literature or leaflets produced by the organization which include quotations from the Koran, calls for observance of the basic tenets of Islam, and analysis of world events affecting Muslims, including denunciation of the mass arrest of independent Muslims in Uzbekistan. Hizb ut-Tahrir’s designation as a nonviolent organization has been contested. Hizb ut-Tahrir literature does not renounce violence in armed struggles already under way—in Israel and the Occupied Territories, Chechnya, and Kashmir—in which it views Muslims as the victims of persecution. But Hizb ut-Tahrir members have consistently rejected the use of violence to achieve the aim of reestablishing the Caliphate, which they believe will only be legitimate if created the same way they believe the Prophet Muhammad created the original Caliphate, and which can occur only as a result of gradual “awakening” among Muslims. Human Rights Watch is not aware of Hizb ut-Tahrir members in Uzbekistan charged with undertaking an act of violence.105 An anonymous leader of Hizb ut-Tahrir reportedly told Ahmed Rashid that “Hizb ut-Tahrir wants a peaceful jihad [struggle] that will be spread by explanation and conversion, not by war.”106 Members of the group in Uzbekistan have uniformly renounced violence and asserted their commitment to peaceful advocacy of Muslim practice and adherence to the goal of a Caliphate. Hizb ut-Tahrir literature states that only God is empowered to determine when the Caliphate will actually come to be. Members also vigorously profess their abhorrence of violence and their belief that the use of violence, particularly murder, is a sin according to Islam. This rejection of secularism and Hizb ut-Tahrir’s view of Islam as a superior social, political, and economic system are at the heart of its stance against democracy. Hostility to Jews is a recurring theme in Hizb ut-Tahrir literature. This is frequently expressed in denunciations of President Karimov as a Jew or kafir (unbeliever). The Uzbek government’s campaign against independent Muslims violates the basic rights to freedom of conscience and religion and freedom of expression, which are guaranteed under the International Covenant on Civil and Political Rights (ICCPR). This section first elaborates on key aspects of these rights, drawing on authoritative commentary by the U.N. Human Rights Committee, the body that monitors compliance with the ICCPR, as they relate to the situation in Uzbekistan. The second part of this section describes the abusive restrictions Uzbek law places on freedom of conscience and religion and freedom of expression. In pressing forth with this campaign, the government violates many other obligations under international law. Not only does the government fail to protect and promote freedom of conscience and religion and freedom of expression, but its attacks on people exercising these rights also involves violations of due process and the right to liberty. Law enforcement and security agents engage in illegal searches and arbitrary arrest and detention. Once in custody, detainees are routinely tortured in violation of the ICCPR and the Convention against Torture and Other Cruel Inhuman or Degrading Treatment or Punishment. The government denies independent Muslim detainees access to counsel and violates their right to a fair trial as guaranteed in the ICCPR. Even after the defendants are convicted and sentenced to prison terms, many continue to be tortured and subjected to other forms of inhuman and degrading treatment. Many aspects of prison conditions in which independent Muslim prisoners serve out their sentences violate U.N. Standard Minimum Rules for the Treatment of Prisoners. More detailed reference is made to these instruments in the relevant chapters of this book. Everyone shall have the right to hold opinions without interference. Everyone shall have the right to freedom of expression; this right shall include freedom to seek, receive and impart information and ideas of all kinds, regardless of frontiers, either orally, in writing or in print, in the form of art, or through any other media of his choice. Articles 18 and 19 allow states to place certain restrictions on the manifestation of religion and on the exchange of information, respectively. With regard to freedom of conscience, article 18 allows only those limitations on the manifestation of beliefs that are “prescribed by law and are necessary to protect public safety, order, health or morals or the fundamental rights and freedoms of others.”130 Similarly, with regard to the right to exchange information and ideas, article 19 permits only those restrictions that are provided by law and are necessary: for respect of the rights or reputations of others; for the protection of national security, or of public order or of public health or morals. Uzbek law violates many of the standards protecting freedom of conscience and freedom of expression. It limits or outright bans several of these manifestations of religious belief, including worship, building houses of worship, religious dress, religious teaching, the freedom to choose religious teachers and schools, and the freedom to publish and distribute religious texts. These limitations are described in more detail below. Even where domestic law conforms to international standards, Uzbek government practice violates them in ways documented throughout the report. Also in May 1998 the Oliy Majlis (parliament) adopted a series of amendments to the country’s criminal and administrative codes, providing for harsh punishments for violating the 1998 law and for other religion-based infractions.138 In May 1999 both codes were again amended to impose even stricter penalties on crimes related to religious belief and association. The 1998 law proscribes numerous aspects of religious activity. Punishments enforcing these proscriptions were set out in amendments made in 1998 and 1999 to the administrative and criminal codes. Infractions of most articles of the 1998 religion law were to be punished under the administrative code if the infraction was a first offense. Repeat offenses were to be punished by harsh prison sentences, established in two sets of amendments to the criminal code. In practice, courts have handed independent Muslims prison sentences for first-time offenses relating to religious activity. Most relevant in the campaign against independent Islam are articles of the criminal code relating to illegal distribution of religious literature, membership in a banned religious organization, and unsanctioned teaching of religion. These legal cornerstones of the campaign are outlined below. Uzbek law criminalizes expression of “religious extremism,” “separatism,” and “fundamentalism.” Article 5 of the 1998 law proscribes such expression, stating: “The state shall not…allow religious or other fanaticism and extremism.”142 Article 19 of the 1998 law states that persons who produce, store, and distribute materials—including printed documents, video and audio cassettes, films, and photographs—that “contain ideas of religious extremism, separatism and fundamentalism” will be held accountable under the law.143 Neither the law nor any internal regulations provide standards for evaluating at what point religious literature becomes “extremist,” or “fundamentalist,” and in practice the government has used these vague ideological labels to imprison and silence people whose views it did not want openly expressed. The 1998 criminal code was amended to include a provision—article 244-1—corresponding to the restrictions under article 19 of the 1998 law, making possession and distribution of literature containing ideas of “religious extremism, separatism, and fundamentalism” a serious offense. These terms and phrases are nowhere defined. Under the new article 244-1 of the criminal code, producing and storing, with the goal of distributing, materials that contain “ideas of religious extremism, separatism and fundamentalism” became punishable by up to three years in prison. Distribution of literature deemed to fall into one of these categories carries with it a maximum sentence of five years in prison. Under such aggravated circumstances as dissemination after agreeing with a group of people to do so, by using one’s official position, or using financial assistance from a religious organization, foreign state, group, or person, the offense is punishable by up to eight years in prison. Article 244-1 emerged as one of the cornerstones of the government’s campaign against independent Muslims. Members of Hizb ut-Tahrir, in particular, were tried and convicted under it. The 1999 amendments to the criminal code added article 244-2, which invoked the same undefined “extremist” label to impose stricter criminal penalties for membership in a group that holds certain ideas: “Setting up, leading and participating in religious extremist, separatist, fundamentalist or other banned organizations are punishable by five to fifteen years of imprisonment with the confiscation of property.”147 The same actions, if they entail “serious consequences,” are punishable by fifteen to twenty years of imprisonment with confiscation of property. This charge, particularly when levied in combination with article 216, which bans participation in an illegal religious organization, results in the maximum punishment, twenty years in prison, for holding a set of ideas in conjunction with others. Article 14 of the 1998 law bestows the right to perform religious rites and worship to religious organizations and not to individuals. It also restricts the types of groups that may exercise this right. Under articles 8 and 11, only registered religious organizations have the right to function as legal entities and thus engage in rites and worship. Article 8 states that, “Religious organizations obtain the status of a legal subject and can carry out their activities after their registration….” Article 11 warns that religious leaders who evade registration will be punished under the law and, further, that “Officials who allow activity of non-registered religious organizations shall bear responsibility in accordance with the law.” Since only registered religious organizations have the right to carry out religious ceremonies and worship, the legislation effectively criminalizes unregistered religious rites and observance. The government abuses the legitimate process of registration to ensure the prohibition of religious associations it views as hostile. The registration issue, while at first glance benign, is one of the government’s chief weapons against independent Islam. Under the law, failure to register a religious organization not only means that it will not enjoy certain rights, it means that the group is illegal, and that its membership is criminalized. Article 216 of the criminal code sets out penalties for involvement in an unregistered religious organization. Under article 216, as amended on May 1, 1998, organization of, or participation in, the activities of a “prohibited religious organization” is punishable by up to five years in prison.153 The way in which a group might earn the status of a “prohibited organization” is not defined. However, the meaning of this language is informed by requirements and limitations elsewhere in the law; broadly but most importantly legal status is realized through registration with and prior sanction by the state. Under article 201-2 of the administrative code, any person found violating the state rules on religious meetings, street processions, or “cult ceremonies” would be fined or placed under arrest for up to fifteen days. This, like other administrative code articles, appears to have been rarely if ever invoked in the campaign against independent Muslims. The penalties for proselytism and missionary activity are set out in the 1998 amendments to article 240 of the administrative code, and to article 216-2 of the criminal code. As with other offenses under Uzbek law, the first violation carries a fine or period of detention under the administrative code.156 Persons found guilty of subsequent infractions are punished under article 216-2 of the criminal code and may be fined fifty to one hundred times the monthly minimum wage, sentenced to up to six months of administrative arrest, or sentenced to up to three years in prison. In practice, those charged with violation of this and all other provisions of the religion law rarely have been punished under the administrative code, even for a first offense, and, instead, have been tried under the criminal code and given the maximum punishment. The ban on proselytism has far-reaching implications for individuals and religious groups that see it as their religious duty to call on or encourage others to join in their beliefs or practice. The prohibition on such “missionary” activity violates not only the right to freely express one’s belief, and the right to exchange views, it also effectively removes the individual’s right to observe his or her own religious faith, a crucial component of which is attempting to convert others. This provision thereby casts legitimate religious practice as a crime. Article 9 of the 1998 religion law prohibits the “private teaching of religious principles.” Similar to the right to publish and disseminate religious material, the right to instruct others in religion is conditioned on membership in a registered religious organization that has met all of the requirements set forth in article 8, including establishment of a central administrative body. Once this is done, the central administrative body of a given religious organization must obtain a license and register with the Ministry of Justice before it can legally train clergy and others.157 Failure to fulfill these requirements brings with it punishment under the law. With article 9 of the 1998 law, the government of Uzbekistan sought to put a stop to any religious education or activity that was beyond its control. It is illegal to impart religious education outside the framework of a government sanctioned central administrative body of a religious organization. Private citizens may not teach religious subjects. This is a particularly significant prohibition for Uzbek society, given that, historically, religious traditions and precepts were passed on to younger generations and largely kept alive during the Soviet period through private religious education. During the Soviet era, this private Islam thrived separately from officially sanctioned Muslim activity that was controlled by the state and therefore has been termed “parallel Islam.” This phenomenon of coexistence of official and private Islam characterized the later Soviet period, despite restrictions on paper. In addition to articles in the statutes amended in 1998 and 1999 to accompany a stricter religion law, three articles of the criminal code that do not derive from the religion law are also among the primary legal tools used to prosecute independent Muslims. These relate to subversion, organization of a criminal group, and inciting ethnic, racial, or religious enmity. Public appeals to unconstitutionally change the existing governmental system, to seize power to remove from office legally elected or appointed representatives, or to unconstitutionally disrupt the territorial unity of the Republic of Uzbekistan, as well as distribution of material with such content are punishable with a fine of up to fifty times the minimum wage or imprisonment up to three years. The law goes on to say that violent actions against the constitutional authorities carries a penalty of up to five years in prison. When undertaken repeatedly or by a group, perpetrators can be imprisoned for up to ten years. Of particular significance to cases dealt with in this report is the provision in article 159 punishing conspiracy to “overthrow the constitutional order of the Republic of Uzbekistan” with ten to twenty years imprisonment and confiscation of property. Any call for an Islamic state, including the call by Hizb ut-Tahrir members for restoration of a Caliphate, absent any other actions and absent any threats or acts of violence, is considered by Uzbekistan’s authorities to be a crime under article 159. Article 156 refers to incitement of national (ethnic), racial, or religious enmity. In addition to outlawing acts that directly infringe on the rights of others or lead to the physical harm of others, it states that, “Willful action that denigrates national (ethnic) honor or dignity or which offends citizens on the basis of their religious (or atheistic) beliefs, committed with the goal of inciting animosity, intolerance, or discord…is punishable by imprisonment of up to five years.” If actions deemed to fall under this statute are undertaken by prior collusion or by a group, or under other aggravated circumstances, they are punishable with up to ten years in prison. Uzbek prosecutors and judges routinely interpreted this provision as applicable to the possession or distribution of literature. Neither the criminal code nor any other legislation or government regulation defines denigration of a group’s honor and dignity or an offense to an individual, leaving the interpretation to judicial and executive authorities. The opportunities for arbitrary application of this article are apparent and examples are provided in subsequent chapters of this report. It is worth clarifying that the government of Uzbekistan does not prosecute Hizb ut-Tahrir members for hate speech, if defined as incitement to violence.165 Rather, Hizb ut-Tahrir members and other independent Muslims have been charged under article 156 of the criminal code, which punishes speech that “insults” ethnic, national or other groups. The International Covenant for Civil and Political Rights, article 19, which provides for freedom of speech and expression, allows for exceptions only when necessary “For respect of the rights or reputations of others” or “For the protection of national security or of public order (ordre public), or of public health or morals.” The government of Uzbekistan has failed to recognize the right of Hizb ut-Tahrir members to freedom of speech and has instead jailed, tortured, and tried them, with no due process, for their belief in a Caliphate, for exchange of opinions including those in favor of a Caliphate, and for membership in a pro-Caliphate organization. Independent Muslims were routinely brought up on fabricated charges of illegal possession of narcotics (criminal code articles 273 and 276) or illegal possession of weapons or ammunition (criminal code article 248). These charges do not relate directly or logically to religiosity, but were fabricated by police and applied in an arbitrary way by state prosecutors and judges so universally that they became core elements of the government campaign. These phenomena are explained further in other chapters of this report. 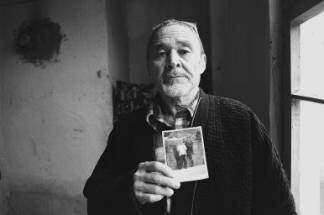 Usman Iusupov, age 64, with a photograph of one of his sons, an imprisoned independent Muslim. Two of his sons are currently in prison for membership in Hizb ut-Tahrir. Margilan city, Fergana Valley. 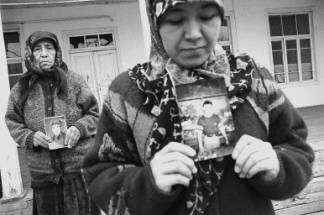 Oiparcha Mirzamatova and her daughter-in-law, with photographs of male relatives imprisoned on religion-related charges. Mirzamatova's son, Ibrokhim Khaidarov, is serving a sixteen-year sentence for membership in Hizb ut-Tahrir. Her daughter-in-law's brother, Khurshid Oripov, was arrested on religion-related charges and died apparently from torture in custody. At least two other male relatives are in prison on similar charges. Margilan city, Fergana Valley. Akhmedjon Madmarov, age 58, with a letter from his son, Hamidulla, imprisoned in Karshi on religion-related charges. Madmarov has two other sons in prison on similar charges. Margilan city, Fergana Valley. Former religious prisoner Bakhodir Ulmasov, who suffered head trauma and other serious injury from mistreatment in prison. His brother (shown in smaller photograph) was also imprisoned on religion-related charges. Margilan city, Fergana Valley. Sadik Vahobov, age 75. His son was arrested while praying in public in commemoration of a friend who had died in prison. He is serving an eighteen-year sentence on religion-related charges. Margilan city, Fergana Valley. 90 Mehrdad Haghayeghi, Islam and Politics in Central Asia, New York: St. Martin’s Press, 1995, p 95. While the Wahhabi doctrine rejects reinterpretation of the Koran and hadith, it does allow for ijtihad, or independent reasoning, in other areas. 91 Jihad: The Rise of Militant Islam in Central Asia, New Haven and London: Yale University Press, 2002, p. 45. 92 Islam and Politics in Central Asia, p. 92. 97 For example, Navruz (celebration of the new year). 99 Hizb ut-Tahrir materials often denounce Israeli occupation of Palestine and Israeli conduct in the conflict there. 100 The German Ministry of the Interior issued a statement on January 15, 2003 announcing that Hizb ut-Tahrir was banned in the country. http://www.bmi.bund.de/dokumente/Pressemitteiling/ix_91334.htm. The ministry statement cited as grounds for the decision, paragraphs 3, 14, 15, and 18 of the German Vereinsgesetz (congregation laws). German Minister of the Interior Otto Schilly said that, “Hizb ut-Tahrir abuses the democratic system to propagate violence and disseminate anti-Semitic hate-speeches. The organization wants to sow hatred and violence.” He also stated that, “The organization supports violence as a means to realize political goals. Hizb ut-Tahrir denies Israel’s right to exist and calls for its destruction. The organization further spreads massively anti-Semitic propaganda and calls for killing Jews.” See also, Peter Finn, “Germany Bans Islamic Group; Recruitment of Youths Worried Officials,” The Washington Post, January 16, 2003. That article states that German officials accused Hizb ut-Tahrir of spreading “violent anti-Semitism” and establishing contacts with neo-Nazis. In April, German police searched the homes of more than eighty people suspected of supporting Hizb ut-Tahrir. No arrests were made. See, Associated Press, “Germany stages new raids against banned Islamic organization,” April 11, 2003. 101 On February 14, 2003, Russia’s Supreme Court, acting on a recommendation from the Office of the Prosecutor General, designated Hizb ut-Tahrir a terrorist organization. According to a press statement released by Russia’s Ministry of Foreign Affairs on June 9, 2003, “The main criteria for the inclusion of organizations in the list of terrorist outfits were: the carrying out of activities aimed at a forcible change of the constitutional system of the Russian Federation; ties with illegal armed bands, as well as with radical Islamic structures operating on the territory of the North Caucasus region, and ties with or membership of organizations deemed by the international community terrorist organizations.” “On the Detention of Members of the Terrorist Organization ‘Islamic Liberation Party’ (‘Hizb ut-Tahrir al Islami’),” Publication of the Ministry of Foreign Affairs of the Russian Federation, Information and Press Department, June 9, 2003, from the Daily News Bulletin, posted June 11, 2003. http://www.ln.mid.ru/bl.nsf/0/43bb94f12ad12c7543256d42005a9b49?OpenDocument On June 6, 2003, fifty-five people alleged to be members of Hizb ut-Tahrir were detained in Russia. Two of the men arrested—one a citizen of Kyrgyzstan, the other a citizen of Tajikistan—were accused of illegal possession of grenades and explosive material. Ibid. As of this writing, Human Rights Watch had no further information about the fate of these two men or whether they were convicted on these charges. The Russian rights group Memorial contested the significance of the law enforcement action, however. The group noted that the majority of the men detained were immigrant workers at a bakery and were released soon after the sweep. “Russian rights group: Detention of 55 'Islamic extremists' was sham,” Associated Press, June 25, 2003. 102 In a recent expression of this view, Larry Memmot, then-first secretary of the U.S. Embassy in Tashkent, told Human Rights Watch that this is “not an issue of religious repression, but political.” Human Rights Watch interview, Tashkent, May 4, 2003. Whether the U.S. government views those arrested on charges related to Hizb ut-Tahrir membership victims of religious persecution has important legal and foreign policy consequences. Under the U.S. International Religious Freedom Act, the U.S. government annually must determine whether governments engage in religious persecution. If the executive finds that governments “have engaged in or tolerated particularly severe violations of religious freedom,” it must choose from a menu of actions, ranging from private demarches through sanctions, with regard to that country. 103 See “The Legal Setting” in Chapter II. 104 Human Rights Watch unofficial transcript, Tashkent City Court trial held in the Chilanzar District Court building, Tashkent, June 30, 1999. For examples of the specific wording of Hizb ut-Tahrir oaths, See “Hizb ut-Tahrir” in Chapter II. 105 Although not charged with involvement in or responsibility for a specific violent act, some Hizb ut-Tahrir members, particularly in Andijan, have been convicted for terrorism under article 155 of the criminal code. Human Rights Watch’s review of these cases found no reference to a violent act having taken place. In one case following the September 11, 2001 attacks in the United States, nine Hizb ut-Tahrir members tried in Tashkent were alleged by the procurator to have links to Osama Bin Laden and al-Qaeda. However, according to trial observers, no evidence was provided to back this claim. One journalist who covered the process described the nature of the alleged connection a “mystery” and quoted defendant Nurullo Majidov’s rejection of the state’s charges, “We do not have connections to Osama Bin Laden or any other terrorist organizations, as we pursue different methods of struggle. We are fighting for our ideas through peaceful means.” Said Khojaev (a pen name), “Tashkent Cracks Down on Islamists,” Institute for War and Peace Reporting, October 12, 2001. The nine men were convicted in October 2001 to prison terms ranging from nine to twelve years. Hizb ut-Tahrir members in the U.K. also denied that the organization had any ties with Bin Laden or al-Qaeda. Human Rights Watch interview with members of the leadership committee of Hizb ut-Tahrir Britain, London, June 29, 2002. 106 Ahmed Rashid, “Interview with Leader of Hizb-e Tahrir,” The Analyst, available on Eurasianet.org [online] http://www.eurasianet.org/resource/cenasia/hypermail/200011/0066.html (retrieved May 9, 2003). 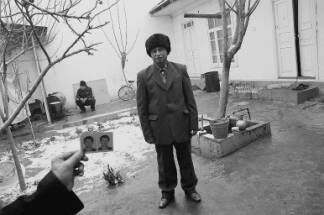 107 Human Rights Watch interview with a member of Hizb ut-Tahrir, name withheld, Tashkent, February 2001. 108 Human Rights Watch unofficial transcript, Tashkent City Court trial held in the Chilanzar District Court building, Tashkent, June 30, 1999. 112 Human Rights Watch unofficial transcript, Tashkent City Court trial held in the Chilanzar District Court building, Tashkent, July 20, 1999. 113 Hizb ut-Tahrir web site [online], http://www.hizb-ut-tahrir.org/ (retrieved May 9, 2003). 116 The group’s writings also hold that criticism of an unjust ruler is the duty of all Muslims. Hizb ut-Tahrir’s draft constitution, which envisions the order that would be in place in a future Caliphate, says, “Calling upon the rulers to account for their actions is both a right for the Muslims and a fard kifayah (collective duty) upon them.” [Article 20 of the draft constitution of Hizb ut-Tahrir ; see, Hizb ut-Tahrir, “A Draft Constitution,“ in The System of Islam (London: Al-Khilafah Publications, 2002), [available online], http://www.hizb-ut-tahrir.org/english/ (retrieved February 22, 2004). Criticizing unjust rulers, then, is a distinctly religious action, as it is viewed as a prerequisite to creation of a worldwide Muslim community, to be awarded by God with an Islamic form of government, or Caliphate. 117 Hizb ut-Tahrir also says that it does not accept a religious system bereft of politics any more than it would accept a political order that was not based on Islam. This is articulated in the book, The System of Islam, a principle Hizb ut-Tahrir text, which reads, “…anything that confines religion to the spiritual dimension, separating it from politics and ruling should be abolished.” Hizb ut-Tahrir, The System of Islam, p. 40. 118 Human Rights Watch unofficial transcript, Tashkent City Court trial held in the Chilanzar District Court, Tashkent, June 30, 1999. 122 This idea is expressed in an April 24, 2000 leaflet entitled “The President of Uzbekistan Admits to Being Intellectually Bankrupt.” It states: “The creed of the people in the Islamic world is the Islamic creed and the creed of Islam is one from which a system emanates organizing all affairs of the people. And this system is the only correct system for the world because it comes from Allah (swt). And every attempt to separate the creed from the system or to mix and patch together different creeds and systems is a consequence of shallow thinking and its outcome is failure.” The leaflet is available at: http://www.khilafah.com/home/lographics/category.php?DocumentID=1&TagID=3 (retrieved May 9, 2003). 123 “Government of Uzbekistan Displays the Decline of Systems of Belief,” Hizb ut-Tahrir leaflet, April 9, 2000 [online], http://www.khilafah.com/home/lographics/category.php?DocumentID=84&TagID=3 (retrieved May 9, 2003). 124 “The Ideology the President of Uzbekistan, Karimov, Wants to Impose upon Muslims,” Hizb ut-Tahrir leaflet, Uzbekistan, July 24, 2000 [online], available at: http://www.khilafah.com/home/lographics/category.php?DocumentID=189&TagID=3 (retrieved May 9, 2003). 126 Hizb ut-Tahrir, “The President of Uzbekistan Admits to Being Intellectually Bankrupt,” Hizb ut-Tahrir leaflet, April 24, 2000 [online], http://www.khilafah.com/home/lographics/category.php?DocumentID=1&TagID=3 (retrieved May 9, 2003). 128 Hizb ut-Tahrir, “The President of Uzbekistan Admits to Being Intellectually Bankrupt,” Hizb ut-Tahrir leaflet, April 24, 2000 [online], http://www.khilafah.com/home/lographics/category.php?DocumentID=1&TagID=3 (retrieved May 9, 2003). This statement is apparently inspired by sura “The Table” [5:82 of the Koran]: ”You will find that the most implacable of men in their enmity to the faithful are the Jews and the pagans…” The Koran, Penguin Books, London, England, 1990, p.88. Translated into English. 129 Ahmed Rashid, “Interview with Leader of Hizb-e Tahrir,” The Analyst, November 22, 2000. 130 Under article 4, the ICCPR allows state parties to derogate from certain articles of the covenant in times emergency that threaten the life of the nation. Article 4 does not permit states to derogate from a number of articles, among them article 18. 131 Human Rights Committee, General Comment 10, Article 19 (Nineteenth session, 1983). Compilation of General Comments and General Recommendations Adopted by Human Rights Treaty Bodies, U.N. Doc. HRI\GEN\1\Rev.1 at 11 (1994). 132 Human Rights Committee, General Comment 22, Article 18 (Forty-eighth session, 1993). Compilation of General Comments and General Recommendations Adopted by Human Rights Treaty Bodies, U.N. Doc. HRI\GEN\1\Rev.1at 35 (1994). 135 Human Rights Committee, General Comment 22, Article 18 (Forty-eighth session, 1993). Compilation of General Comments and General Recommendations Adopted by Human Rights Treaty Bodies, U.N. Doc. HRI\GEN\1\Rev.1at 35 (1994). 137 The 1998 law replaced the law on religion enacted at the end of the Soviet era on June 14, 1991, three months prior to independence. All citations from the 1998 religion law are from the English translation of the law in BBC Monitoring, May 20, 1998, translated from the original publication of the law in Russian in Narodnoe Slovo, May 15, 1998. 138 Law of the Republic of Uzbekistan on Amendments and Additions to some Legal Acts of the Republic of Uzbekistan, May 1, 1998. 139 Uzbek Radio first program, May 11, 1998, English translation in BBC Monitoring, May 11, 1998. 140 BBC Worldwide Monitoring, quoting Interfax, May 1, 1998. 142 Article 5, Law on Freedom of Conscience and Religious Organizations, May 1, 1998. 143 Article 19, Law on Freedom of Conscience and Religious Organizations, May 1, 1998. 144 Law of the Republic of Uzbekistan on Amendments and Additions to some Legal Acts of the Republic of Uzbekistan, May 1, 1998. 145 Article 244-1 states: “Preparation or possession, with the aim of disseminating, of materials containing ideas of religious extremism, separatism or fundamentalism, calling for pogroms or forcible eviction of citizens, or intended to create panic among the population, committed after administrative punishment has been levied…” carries punishment ranging from a fine equal to fifty times the minimum wage to three years in prison. Meanwhile, “Preparation or possession, with the aim of disseminating, of materials containing ideas of religious extremism, separatism or fundamentalism, calling for pogroms or forcible eviction of citizens, or intended to create panic among the population, as well as use of religion to disturb the harmony of the citizenry, spreading slander, destabilizing the situation through deception, and committing other acts aimed against the established regulations for public conduct and public safety” are punishable with up to five years in prison. Those people found to have committed the above infractions under aggravating circumstances—“by preliminary agreement or as part of a group, by using one’s official position, or with the financial or other material help of a religious organization or foreign government, organization or citizen”—can be sentenced to up to eight years in prison. 146 Article 246 of the criminal code, as amended in 1998. 147 A number of punishments spelled out in Uzbekistan’s criminal code include confiscation of property. Execution of this sentence can result in negative consequences for members of the convicted person’s family as well as for the individual. 148 According to the Ministry of Justice, Presidential Decree 882, signed on August 14, 1998, allows for registration of religious groups with smaller congregations if and when a special commission of the Ministry of Justice deems it appropriate. Khalq Sozi (The People’s Word)(Tashkent, Uzbekistan), September 30, 1998, English translation in BBC Monitoring, November 11, 1998. 149 Article 8, Law on Freedom of Conscience and Religious Organizations, May 1, 1998. 150 Article 19 of the religion law states that “‘Religious organizations’ central administrative bodies have a right to produce, export, import and distribute the religious items, religious literature and other materials with a religious content in the order established by the law…Delivery and distribution of religious literature published abroad is allowed after its content is examined…Religious organizations’ central administration bodies have an exclusive right to publish and distribute religious items provided they have a corresponding license….” Law on Freedom of Conscience and Religious Organizations, 1998. 151 Khalq Sozi, September 30, 1998, English translation in BBC Monitoring, November 11, 1998. 153 In 1999, article 216 was again amended to change the reference to “prohibited” or “banned” groups to “illegal public associations or religious organizations;” the penalty remained unchanged. Law of the Republic of Uzbekistan on Amendments and Additions to Certain Legislative Acts of the Republic of Uzbekistan, dated April 15, 1999, printed in Narodnoe Slovo, Tashkent, May 12, 1999, English translation in BBC Monitoring, May 13, 1999. Hizb ut-Tahrir is frequently referred to as a “banned” organization, leading some to believe that the government singled it out for prohibition. However, its “banned” or “prohibited” status derives from its lack of registration and from the “religious extremism” the government ascribes to it. 154 Article 216-2 has rarely been invoked. Instead, prosecutors routinely levy and judges employ the principle provision, article 216, which carries a stiffer penalty, up to five years in prison. Also under article 216-2, members of unregistered religious organizations who “organiz[e] and [hold] special meetings for children and youth as well as labor, literature and other circles and groups that are not connected with performance of religious rites by the servants and members of religious organizations” face a sentence of up to three years imprisonment. 155 Article 7, Law on Freedom of Conscience and Religious Organizations, June 14, 1991. 156 Article 240, “Violation of the Laws on Religious Organizations,” allows authorities to punish proselytism with a fine equal to five to ten times the monthly minimum wage—3,535 som, approximately U.S. $4, in 2003—or administrative arrest for up to fifteen days. In April 2003 the Labor and Social Security Ministry announced this figure for the minimum wage. Uzland.uz web site, in Russian, April 1, 2003, English translation in BBC Monitoring, April 1, 2003. 157 Article 9, Law on Freedom of Conscience and Religious Organizations, May 1, 1998. 158 Law of the Republic of Uzbekistan on Amendments and Additions to some Legal Acts of the Republic of Uzbekistan, May 1, 1998. 160 As noted above, the U.N. Human Rights Committee has stated that, “The observance and practice of religion or belief may include not only ceremonial acts but also such customs as the observance of dietary regulations, the wearing of distinctive clothing or head coverings, participation in rituals associated with certain stages of life, and the use of a particular language customarily spoken by a group.” Human Rights Committee, General Comment 22, Article 18 (Forty-eighth session, 1993). Compilation of General Comments and General Recommendations Adopted by Human Rights Treaty Bodies, U.N. Doc. HRI\GEN\1\Rev.1at 35 (1994). 161 For more information, see: Human Rights Watch, “Class Dismissed: Discriminatory Expulsions of Muslim Students,” A Human Rights Watch Report, Vol. 11, No. 12 (D), October 1999. 162 Article 7, Law on Freedom of Conscience and Religious Organizations, June 14, 1991. 163 The primary exception to the application of article 159 to those charged with religious infractions is in cases involving membership in Hizb ut-Tahrir under so-called mitigating circumstances. Specifically, if a person charged with membership in the group claims that he or she became a member “accidentally,” that he or she is in fact not a member at all, or that he or she stopped attending the group’s study sessions and did not participate in distribution of the group’s literature, then that person has, in some cases, avoided prosecution under article 159 and is most routinely charged under article 216, punishing membership in an illegal religious organization, which carries a shorter maximum prison term. 164 As of this writing, there were no known cases of an independent Muslim being sentenced to death under this particular article. 165 In none of the cases cited in this report are independent Muslims prosecuted for speech that was demonstrated to be a direct and imminent incitement to violence.